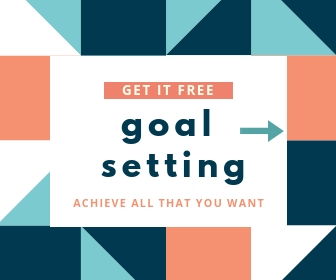 There are special moments in our lives when we feel deeply grateful for what is and has been. Today I enjoyed one such moment. I got a parcel in the post. 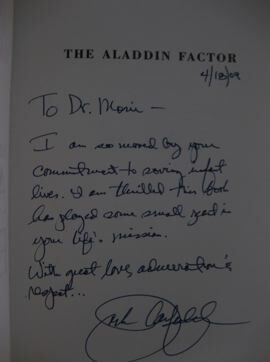 Opening it, I found a copy of one of my all-time favorite books, “The Aladdin Factor” – but this one was VERY special. Inside the front cover was a hand-written note from the author, Jack Canfield – to ME! I was deeply moved when I read that brief note from an author I have admired, respected and read for decades! And also extremely thankful for the person who made this possible – Lee Ann Price. How it happened is an interesting story. I am active on Twitter. 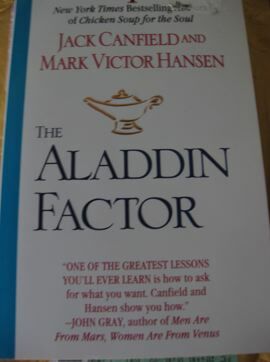 Once I tweeted about the power of asking, and mentioned “The Aladdin Factor”. Lee Ann Price saw my tweet – as it turns out, at a stoplight while she was driving to an event where Jack Canfield would be speaking! She had picked a book to have autographed by Jack earlier that morning – and surprise, surprise… it was “The Aladdin Factor”! Speak of coincidences! Lee Ann mentioned this curious event to Jack, told him about my work with children having congenital heart defects, and even showed him the tweet I posted! Special moments and sweet memories happen quite by chance most of the time. And what makes them happen is never easy to predict or control. For that very reason, they are more cherished and enjoyed. Thank you, Lee Ann, for making my day! Y’know what was even nicer? And I got a chance to tell her a bit more about what I do with my ‘heart kids’. Thank you for that, too, Lee Ann. On Thursday, at dinner, my teenage niece was aghast at what I had just done. My cellphone beeped, indicating a message had arrived. And I IGNORED IT! Shock written large on her face, she turned back to her meal. On Friday, my cousin walked into my office asking if I would help him by sending an email to the University he was registered at. I explained how I had once emailed them for a related matter, and they never did get back to me… about how unreliable email had become. He was still shaking his head in amazement as he left the room. On Saturday, I got a Twitter DM (direct message) from my friend Kevin Riley. He wanted some information to use in a manifesto he’s working on. I replied to it within a half hour. At the same time, in my email inbox, I have over 800 messages lying unread. Barely 1 in 30 get a reply. And 50% won’t ever reach me, as my virtual assistant filters and deals with them. When this realization struck me, I was just as surprised as my niece and cousin. Once upon a time, email had consumed half my working life! So… what technology is “best”? Because at our core, we are not ‘technology-driven’ – but ‘human nature driven’. We have different preferences and choices, likes and dislikes, favorites and hates. That’s why I’ll blithely ignore SMS or email and respond promptly to a Twitter DM, while a teenager will stay glued to her cellphone that acts as her lifeline to a network of her friends, and a teacher will believe email takes priority over all else and must always get a response. What technology do YOU prefer?